The New England Cytometry User’s Group (originally Boston Users Group for Cytometry) founded September 1994, was renamed in November 2005, to reflect the forum’s growth. The New England Cytometry User’s Group continues to provide a forum for discussion and debate on topics pertaining to the science of Cytometry. The forum organizes conferences and presentations of specific interest to the New England area clinician, research scientist, laboratory/clinical associates, and students. 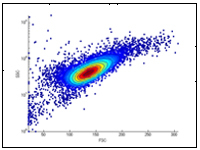 Membership is open to anyone with an interest in the field of Cytometry. Each member’s invaluable perspective helps us create an environment rich in diversity. We strive to use this diversity to educate each other to the ever changing face of Cytometry. Hello. I have a bit of a strange request. I’m making an educational art project and I would like to incorporate a PI x BrdU stain as an example of typical Cell Cycle analysis. I do not currently run this sort of assay so I was wondering if someone who has some data would mind sending me a few ‘good looking’ representative .fcs files that I could sift through and choose one to use in my work. Preferably one with a nice distribution of G1, S, and G2 cells. A brief explanation of what the cells/experiment is would also be appreciated.